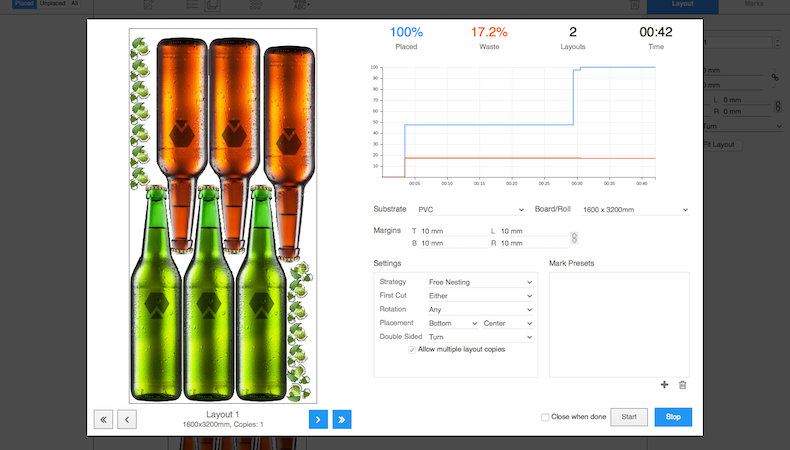 Fujifilm has added the tilia Griffin wide-format automatic layout solution from Tilia Labs to its XMF workflow offering. Available either to buy, or on rolling subscription, tilia Griffin features barcode tracking, camera registration, grommets etc. "Tilia Griffin's workflow and design is so simple and intuitive even the most novice user can be up and running in no time," commented Tilia Labs CEO Sagen de Jonge. "It features a modern, ultra-responsive interface, beautiful visuals, and an intuitive design and it's designed to work well with virtually all printers and cutting tables." "Any print shop creating layouts manually and struggling to meet deadlines or failing to maximise substrate usage will enjoy immediate benefits." Fujifilm said integrating Tilia Griffin with XMF automates the manual process of nesting multiple wide-format jobs. “Mainly, what we are providing customers is savings in time,” said Fujifilm workflow product group manager John Davies. “Getting a human to fill in the task of nesting and setting up multiple jobs on the same substrate uses their time inefficiently when it could be better served elsewhere." Tilia Labs’ system offers shape nesting with any rotation, using the engine of its Phoenix software, which automates nesting for commercial printing. The Griffin also aims to minimise substrate waste and associated costs and increase throughput. Its user interface, built on Tilia Labs’ new Aries UI platform, is described by Fujifilm as “ultra-responsive and attractive”, intended to be easily accessible for new users. The software also features barcode tracking, camera registration, and grommets. Last month, Fujifilm launched its Illumina LED UV retrofit curing system in Europe.